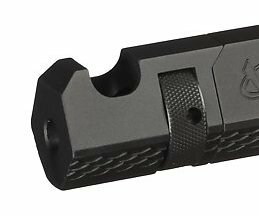 Screw on compensator/muzzle brake fits the Volquartsen LLV-4 Upper (barrel) for Ruger® MK IV® pistols. Beautifully shaped to match the unique contour of the LLV-4 system. It is CNC-machined from an aluminum alloy to minimize weight and black hard anodized for durability. Installs directly onto the threaded muzzle of your LLV-4 Upper... Uses a knurled nut to secure to the muzzle threads. Pin wrench for installation is included. Love the design. Absolutely does the job. 1st time at the range I'm shooting my Bullseye steel at 60 ft with no problem. Spotter confirmed virtually no muzzle rise. The thing just looks cool and was the swing vote between me getting a MKIII based full on volquartsen or buying a MKIV and adding the upper. The scales and lines flow well into the LLV-4 upper nicely. Looks like it's supposed to be there. Easy to clean design, and looks like it actually would have some effect on the miniscule muzzle rise of a 22. Unlike many other comps with holes all around that are more for looks. Costly, but I can't see having the LLV-4 upper without it. It completes the gun.